Today, I’ll be going in more detail about a product I briefly introduced on my blog back in September in my Amie product post. 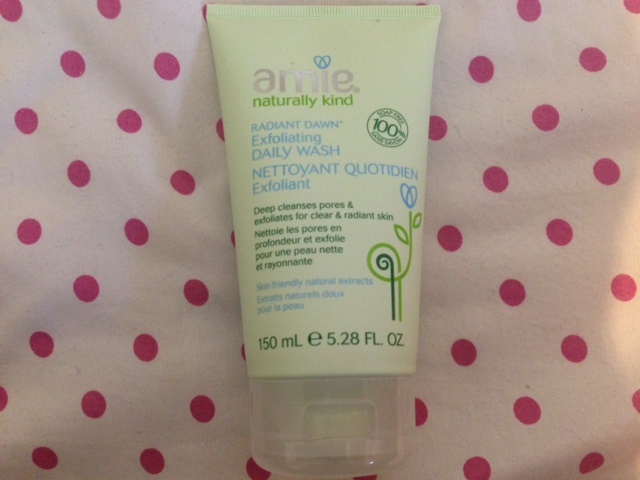 Out of all the fantastic Amie products I’ve tried, this one has been my current favourite for the past few months and is really effective in combating pimples! 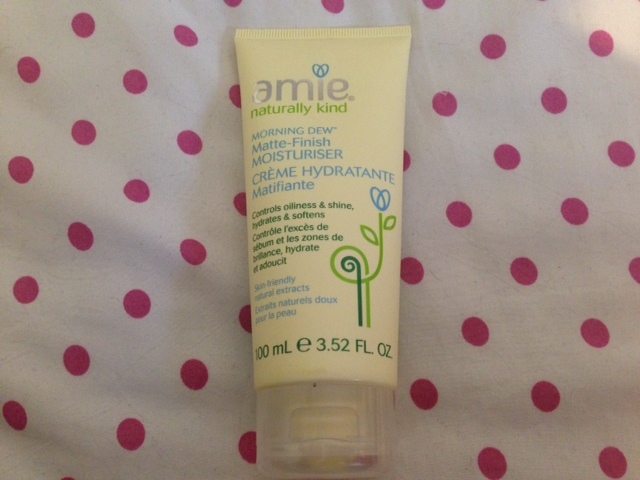 First off, can I say how much I love the packaging of Amie products?! I feel like I mention that every single time I write a post on them, but I love the girly pastel colours! The deep cleaning mask is a deep cleansing mask that cleans deep down into your pores to draw out dirt, while soaking up excess oil. 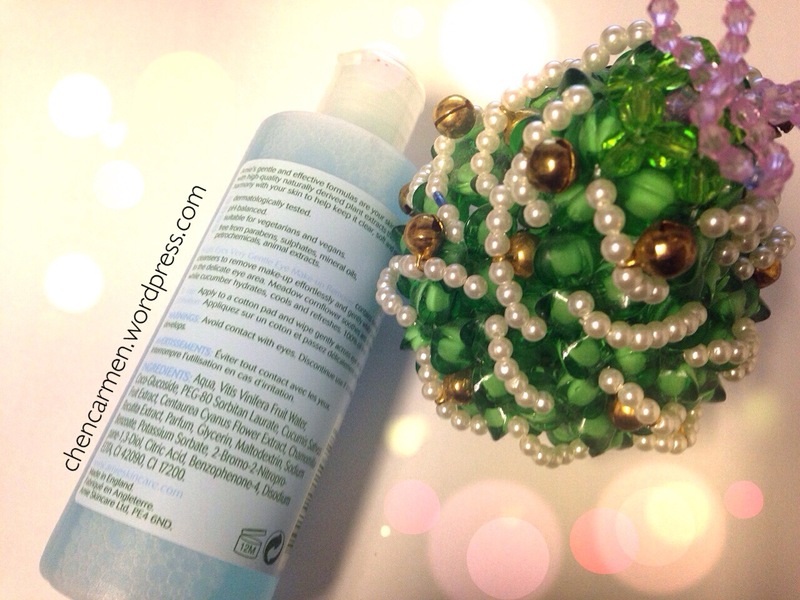 Soaking up excess oil will help prevent future breakouts! As for the texture, it has a bit of a clay consistency. The mask smells like peppermint with a hint of essential oils. Whenever I feel an annoying pimple starting to form, I rely solely on this product to get rid of it before the pimple actually comes out!! This is a really powerful product and will combat and kill your pimples before they even reach the surface. I prefer to only use this product on problem areas, or where I’m breaking out. I find that this mask is pretty intense (and it has to be to kill those pimples! ), and it may sting if you apply it to your entire face. The peppermint in the mask may also make your face feel slightly warm. Since this mask is pretty intense, I recommend it for those with oily skin just like myself. I’m not sure how this product works for non-oily skin types, so I don’t want you to blame me if it doesn’t work as well for you=) Let me know if you’ve tried this mask and you don’t have an oily skin type! This is one of my favourite products of all time as it really does get the job done, quickly and effectively! What is your go-to pimple killer? I am baaaackkkk with another Amie product post! 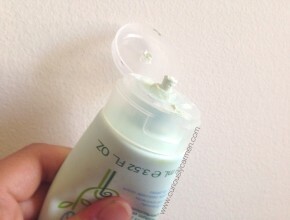 I have been using The Body Shop’s Chamomile eye make up remover for around one year now. I used to like it a lot but I found that over the past few months, it started to irritate and sting my eyes a bit. I’ve been trying to find a different one to use, so when Amie contacted me again to try their eye make Bright Eyes Eye Makeup Remover, it couldn’t have came at a better time. 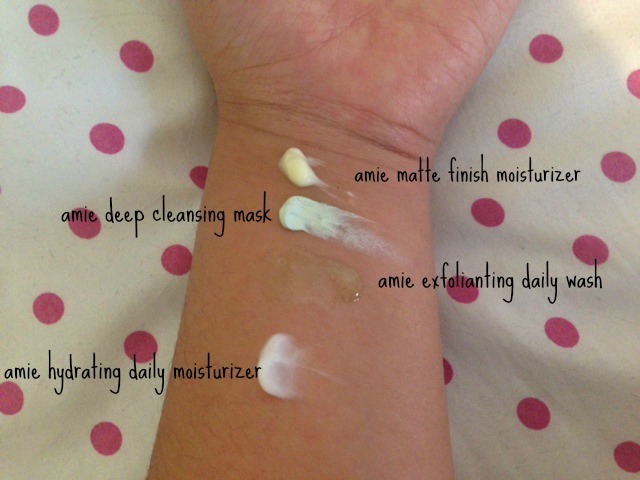 I’ve probably mentioned this before, but one thing that I love about Amie products are that they are made with almost all natural ingredients. In particular, the makeup remover is 98.9% natural. Just like my Body Shop chamomile makeup remover, this also contains chamomile. 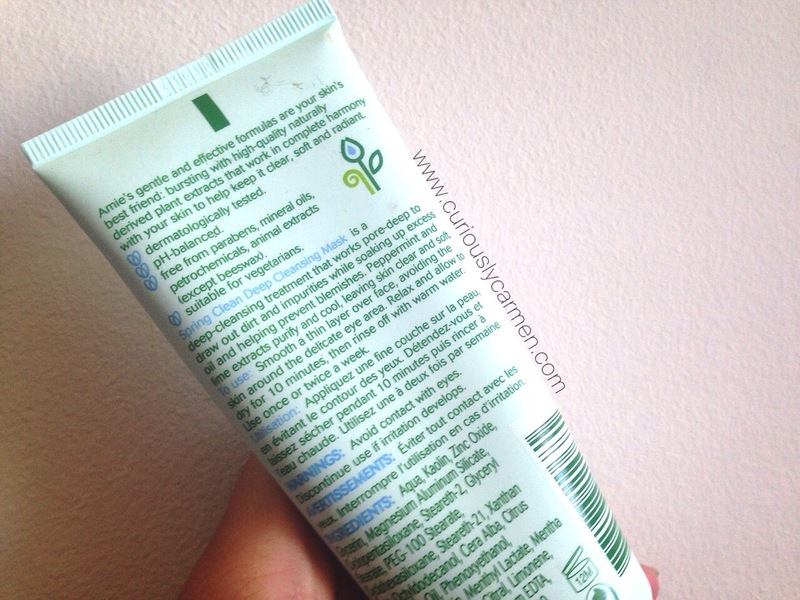 It is also free from parabens, sulphates, mineral oils, petrochemicals, and animal extracts (making it suitable for vegetarians and vegans). The product itself is a blue liquid, and has a watery consistency – it is not thick or gel-like. When I first opened the product, I noticed that it had a scent that I didn’t really like. It didn’t smell like chemicals, I’m not really sure how to describe the smell… just that I didn’t like it. As per normal, I dabbed a few drops of this on to a cotton pad and wiped it over my eyes. My eyeliner came off immediately, but there were still little mascara flakes around my eyes that I had to wipe again. It also stung a little, but not as much as my usual makeup remover. I wonder if my eyes are just sensitive… both of these products shouldn’t sting and are already really gentle. On days where I wore eyeshadow primer and eyeshadow, I found that it was harder to remove. It took probably three or four wipes to completely take off my eye makeup when wearing eyeshadow and primer. Because of this, I think that this makeup remover is suitable for someone who wears minimal amount or is just starting to wear eye makeup. It is okay to use on a daily basis but I wouldn’t use this to remove makeup if I was wearing a lot that night. I wouldn’t recommend using this product if you use a lot of eye makeup. Do you have any good makeup remover suggestions? Please let me know in the comments! This product was sent free of charge in exchange for a product review. Opinions are my own and are not altered by the requests of Amie. 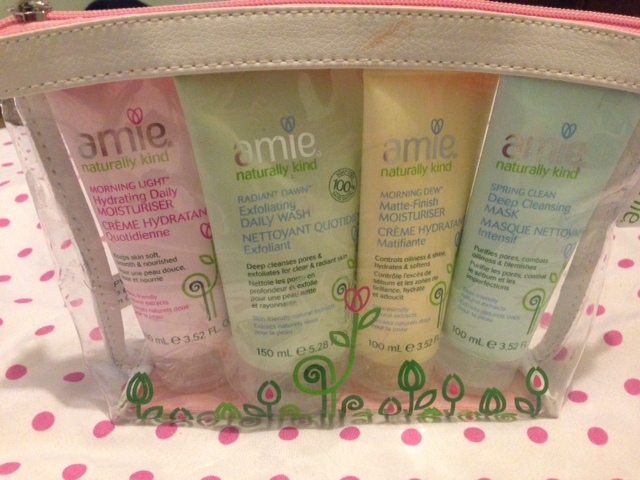 After being introduced to a few Amie products in September, I have quite liked all the products in the line so far. If you haven’t read my previous post on Amie products, Amie is a UK-based skincare company that has recently launched products in Canada. 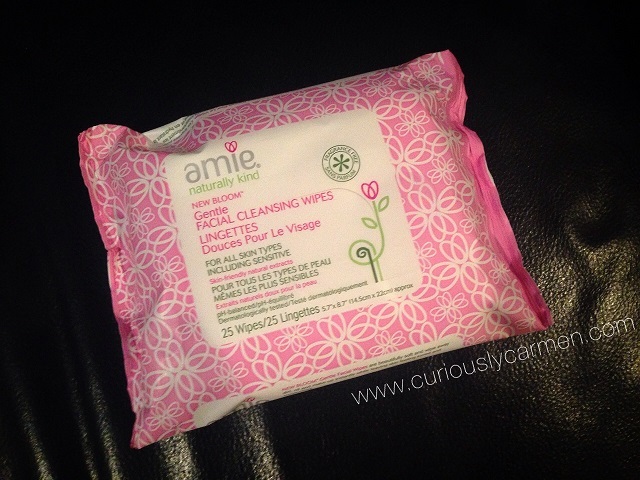 For now, Amie products are exclusively available at Shoppers Drug Mart locations, but I haven’t been able to find any of the Shoppers locations that I go to. I think maybe because they have just recently launched, they are slowly bringing it to all the stores? Also, am I the only one that finds the Shoppers website hard to use? I tried to search up which locations sell Amie products but it was giving me a difficult time like always… I guess I’ll just try my luck by visiting the stores in person, hopefully each Shoppers will carry Amie products soon! Looks the same as the facial wash, amirite?! First impression: The packaging and design of the bottle was the same as the previous Amie products I tried, so nothing new there. 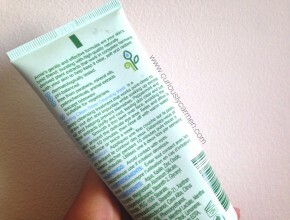 The colours of this tube are also the exact same as their hydrating daily moisturizer which added to the confusion. It may not seem that confusing but trust me, when you are half awake at 7 am on a Monday morning, things can get tricky (that or I need more sleep). 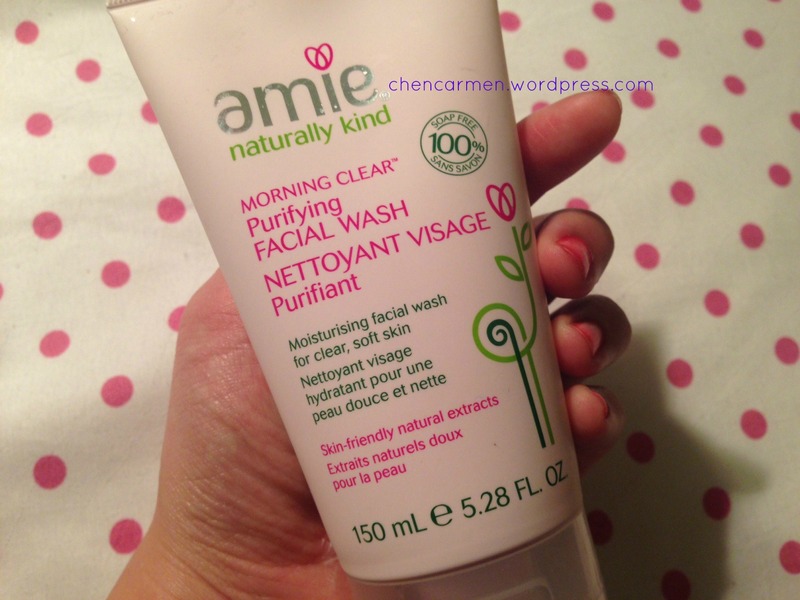 Compared to Amie’s exfoliating daily wash, this facial wash had a very creamy texture. In fact, the first couple of times using this was a bit strange to me because the texture was exactly like moisturizer, and I felt like I should just be applying this on my face as a cream rather than washing it off with water. 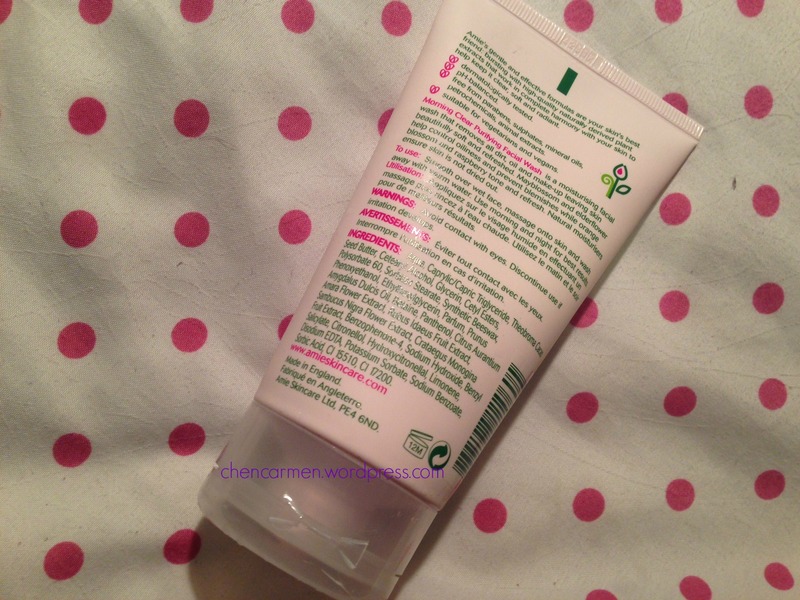 My favourite part of this facial wash, and what made it stand out for me was the scent! My goodness, if Amie ever came out with a perfume that smelled like this facial wash, I would be their first customer. The facial wash had a very flowery and girly scent to it. After washing my face, the scent stayed on for awhile and was quite noticeable, the boyfriend could smell it as well. This product was also purposely sent to me in the upcoming winter season, as it is supposed to protect your skin against the cold. After a few days of usage, I noticed that my skin was a bit softer. I’ve been suffering from very dry skin lately, which was very surprising because my skin tends to be the opposite- very oily!! I’m pretty sure this facial wash played a vital role in moisturizing my skin, it doesn’t feel as dry and look as flaky anymore. One of the main ingredients in this face wash is cacao seed butter (no, I don’t mean cocoa) which contains a very high amount of antioxidants and is really moisturizing as well. I probably wouldn’t use this when it starts to get warm again because it’ll just make my face extra oily. But in the current weather, it brings a good balance to my skin. Yay! My Amie haul from September- Click to read! Another great thing about this product is that it is free from parabens, sulphates, mineral oils, petrochemicals, products that have been genetically modified, and animal extracts. Amie also does not test on animals. All products are suitable for vegetarians and vegans, and their formulas contain high-quality plant and botanical ingredients. No, they did not pay me to write that! 🙂 It is also 100% soap free but to be honest, I’m not sure what kind of pros are involved in that so I’ll have to contact Amie and get back to you LOL. If you know, please leave a comment and enlighten us all. 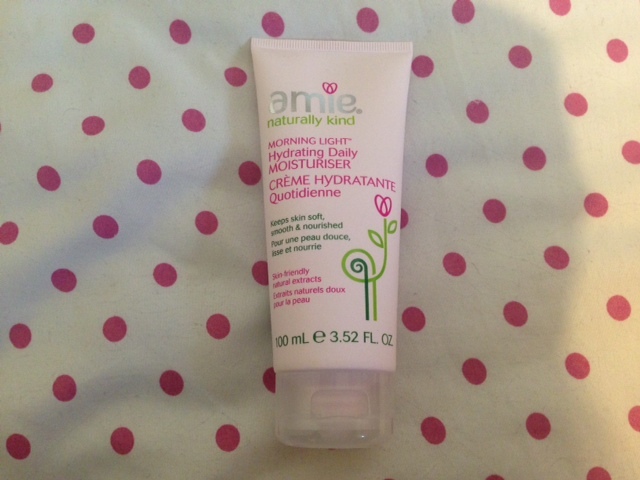 Well, another great and moisturizing product from Amie! 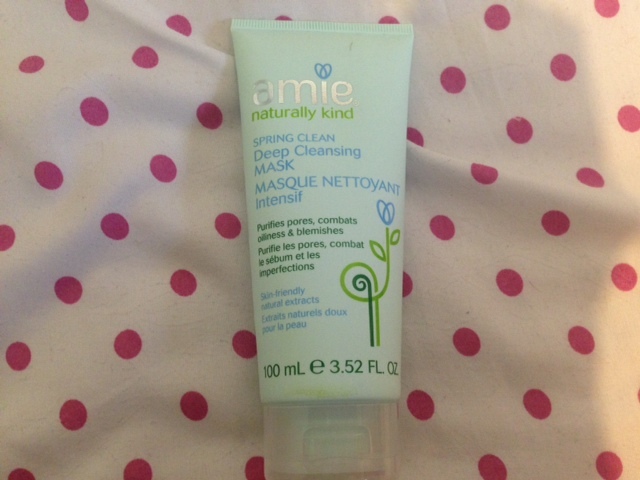 Have you seen any Amie products in your local Shoppers Drug Mart? Please let me know in the comments down below! Update (12/2/2014): After asking Amie what the benefits of a soap-free product are, it means that the ingredients in soap (Sodium Laureth Sulphate and Sodium Lauryl Sulphate) have a high pH level since it is an alkaline/base (remember your high school chemistry? haha). Therefore, it can disrupt your skin’s natural acid balance due to it’s high alkalinity, which can leave skin feeling dry and taught (I personally hate that feeling). In case you didn’t know, acid and base are opposites. For example, Tums stomach pills are high in alkalinity because when you have a stomachache or heartburn, the acid in your stomach increases, so the Tums balances out the acidity. Hm, the things you learn beauty blogging!